1. 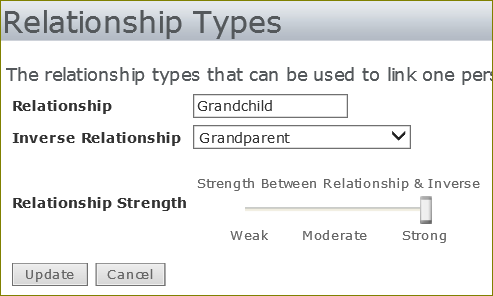 From the Administration menu, click the Relationship Types option located under the CUSTOMIZE option. 2. Click the Add link. 3. Enter a Name for this Relationship. The first Relationship Type does not have an Inverse. The first relationship you enter has no Inverse Relationship, so leave the inverse blank. After you create at least one Relationship Type, you can select it as the inverse of the second one you create. Each Type can only have one Inverse. Each Relationship Type can have one inverse. 4. Set the Relationship Strength, as desired. 5. Add another Relationship Type. 6. Select the Inverse Relationship. This is likely be the Relationship Type you previously created. 7. If using Peer Network, set the Relationship Strength. Move the strength bar to the desired position. If the strength bar is not moved from the far left position, Arena does not calculate this Relationship.